We drink so much wine, that our landlord finally noticed. 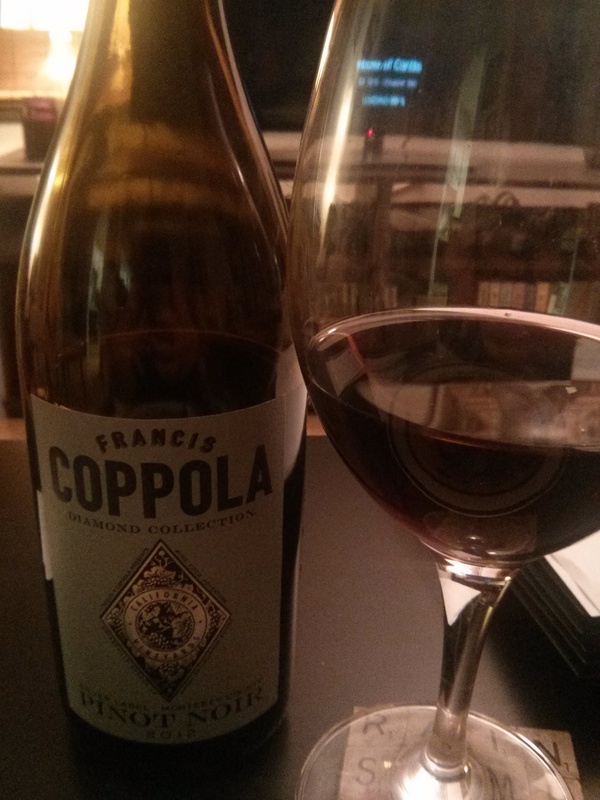 After my other half did him a favor using his technical ninja skills, our landlord gifted us a bottle of a 2012 Francis Coppola Pinot Noir. The Diamond Collection wine has a fruity, long-lasting flavor— think raspberry! raspberry! It’s a bit dry, but does the job. For those staring at the photo, yes, we watched House of Cards as we finished off the bottle. This is an average pinot noir, I’d say. It’s not the best, but it’s pretty good, as my other half said. But, he was quick to point out, it’s no Wolff Vineyards Syrah. Alcohol content: Forgot to write it down! When to drink: Have the in-laws over for dinner and bring this red out. It can be a conversation piece—who doesn’t want to talk about The Godfather—and it’s middle-of-the-road enough to please a crowd.